DECLARATION OF INDEPENDENCE. Copperplate engraving printed on thin wove paper. Imprint at bottom left, “W. J. STONE SC WASHn” [William J. Stone for Peter Force, Washington, D.C. ca. 1833]. Printed for Peter Force’s American Archives, Series 5, Vol I. 25¼ x 30&frac78; in. The United States emerged from the War of 1812 truly independent. The country had survived its second conflict with Great Britain, and the Louisiana Purchase had doubled the size of the nation. Tested in war and peace, America was on the verge of enormous physical, political, and economic expansion. It was a time of optimism, widely known as the “Era of Good Feelings.” As the 50th anniversary of independence approached, a new generation sought out icons of the nation’s founding. 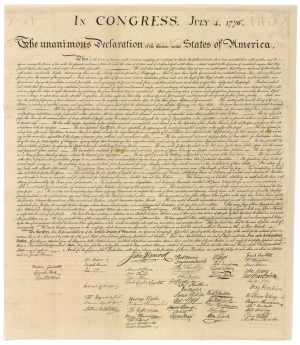 The Declaration of Independence, with its not-yet-famous signatures, became the subject of several engravings of varying quality. Several years later, noted archivist Peter Force (1790-1868) planned to include new facsimiles in his planned 20-volume American Archives: A Documentary History of the United States of America. Congress authorized the project on March 2, 1833. Force immediately went to Stone to have the documents printed, with only two differences: the second editions were on thin wove paper, and the imprint line was shortened and moved to the bottom left. (Perhaps Force thought he would sell 1,500 separately and as many as 2,500 additional copies of American Archives by subscription.) On July 21, 1833, Stone invoiced Force for 4,000 printed copies the Declaration. After mounting expenses and increasing production delays, by 1843, when Force received Congressional re-authorization for Series IV, he had scaled back his subscription plan to 500 copies. The volumes into which the Declarations were placed did not appear for several more years. After the project was canceled in 1853, Force sold his enormous collection of original documents to the Library of Congress for $100,000. Despite Quincy Adams’s intentions, the engrossed Declaration manuscript continued to be mistreated. Displayed in direct sunlight for more than 30 years, disastrously faulty conservation work, and other insults have irreparably damaged the original; about 90% is completely illegible today. Therefore, the Stone/Force printings are the best representation of the Declaration as it was when members of the Continental Congress put their lives on the line to sign the manuscript in August of 1776.